Inner Child Healing: How to Heal Your Emotional Wounds from Childhood? Are you constantly seeking approval from someone else? Are you still craving for someone to love you? Or do you feel disappointed when others don’t love you the way you wanted? If so, perhaps you might want to revisit your childhood. Most of us didn’t get the love we wanted as a child. As a child, I wished my parents were more supportive, empathetic, and encouraging. When I grow up, I realize that I’m still subconsciously longing for them to accept me and my career choice. And it’s not like they are “bad” parents, they are just not able to provide me with the kind of love I desire. I needed emotional connection and validation, but it’s not something they are comfortable with giving. We think as adults by getting into a relationship or achieving success, we will feel loved and happy. But yet, something feels missing. A part of us feels unfulfilled because we still yearn for the love we wanted as a child. What Is Your Inner Child and Inner Parent? In my latest book, Parent Yourself Again, I introduced two subpersonalities that are used in psychology and psychotherapy. These two subpersonalities are the inner child and inner parent. The inner child represents the part of us that was a child. It stores our memories and emotional pain. But often, it gets denied or ignored by our inner parent. The inner parent represents the part of us that protects and nurtures our inner child. However, it doesn’t always do things that benefit the inner child, especially when our inner child shows up with its emotional wounds. It usually protects itself by suppressing the inner child. Our past still very much dictates our actions and behaviors now. Even though we are adults now and we think that we have overcome our past or forgotten about it, but the inner child never forgets. Your actions and behaviors, and even your relationship now might be a result of your bad childhood. The unresolved emotional pain might also cause physical pain in your body, for example, migraine, fibromyalgia, and other chronic pain. 1. Remove the protective mechanisms gradually. Most of us have this tendency to push away or avoid our emotional pain. It feels like a threat to our survival. We are afraid that we can’t handle it so our mind builds protective mechanisms to prevent us from feeling the pain. But the more we resist it, the more pain we feel because our wounded inner child has needs that aren’t met. It wants to be acknowledged, loved, and cared for. By removing our defenses, we allow the inner child to be seen. At first, when your inner child is coming out, it might hurt quite a bit. But if you work on your emotional wounds by removing your protective mechanism gradually, you will find it is possible to let go of the hurt feelings. You will realize that when you go deeper into your emotions, there is actually love and peace buried deep down inside of you. They are just covered up by your protective mechanisms. 2. Grow your inner parent. Parent Yourself Again, is not just about reparenting the inner child. It’s about growing the inner parent too. The inner child is not at fault. Children find it difficult to deal with overwhelming emotions such as grief and helplessness. It’s your responsibility to help it cope with these emotions. Care for your inner child like what a parent would do. Apart from knowing what your inner child needs, we also need to learn how to protect and nurture the inner child. Anything that you feel a good parent provides to their children, you should do the same for your inner child. Certain events that feel traumatic for a child might not feel as traumatic for an adult. Having empathy for your inner child is important. They need the inner parent’s guidance and understanding to let go of their pain. Whenever you are healing your inner child, it’s crucial to stay mindful. You must realize you are not the inner child. You are not your past. Yes, you had experienced something traumatic and painful in the past, but you are no longer the child that hurts. It’s easy to get sucked into the past when you are doing inner child work. And if you are not careful or aware enough, you can get stuck in an emotional state for a long time. Accept your past but don’t indulge in it. The key is to learn how to accept your past as it was. There is nothing you can do to change your past but to accept it. If you keep resisting your past and spend too much time and attention on it, it just brings you away from the present moment. Mindfulness is all about paying attention to the present moment. Even though your emotional wounds are products of your past, but you can respond and deal with the feelings accordingly as they arise in the now. What’s Inside Parent Yourself Again? 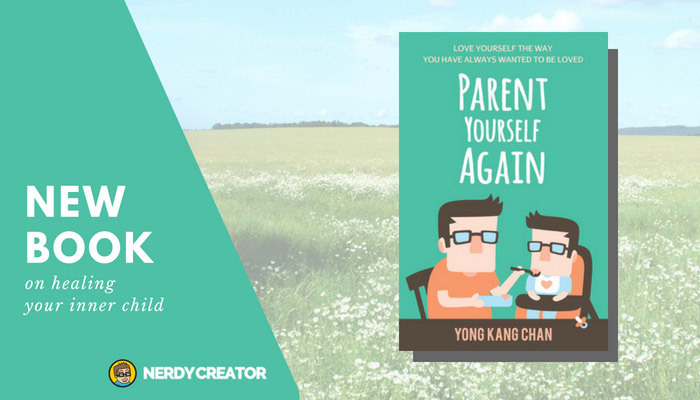 The purpose of this book is to help you learn how to love yourself and be your own parent. Whether you have overprotective, toxic, controlling, abusive, narcissistic parents or not. What your parents failed to do for you in the past, you can do it for yourself now. If you have read this book and find it helpful, could you help me leave a review on Amazon (Here is the link)? Your feedback will not only help me grow as an author, it will also help those who need the message in the book. You can also share this blog post using the buttons at the end of this blog post. Thank you. Don’t Have a Kindle Device? Here Are the Alternatives.